The escalator may soon have a bold new look. 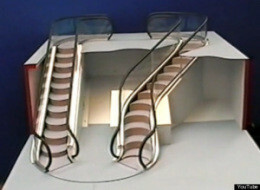 Developed by City University London professor Jack Levy, the so-called Levytator resembles a conveyor belt and is the world’s first freeform, curved escalator. How does it work? “Unlike traditional designs, where redundant steps move underneath those in use, the Levytator utilises a continuous loop of curved modules, which can follow any path upwards, flatten and straighten out, and descend once more, all with passengers onboard,” City University London explains. UPDATE: A HuffPost reader points out that there is a curved escalator at the Wynn in Las Vegas, while another notes that there are curved escalators at the Forum Shops at Caesar’s Place. It is not clear that these make use of the Levytator’s technology.